This idea of having migrants placed in sanctuary cities has put the left-wing media into another frenzy. The plan is crazy … heartless … obnoxious … and even illegal – so they say. Personally, I am a very pro-immigration conservative – which means legal immigration with proper vetting. I believe we should have an immigration policy of strict enforcement of our laws. I also believe that most of those seeking asylum would be an asset to our nation. I am not a racist in any way. So, I do not care that those seeking to be in the United States are Hispanics, Asians, Africans or even white Europeans. I have to put forth my personal beliefs because my reaction to the suggestion to locate many of the illegal border crossers in sanctuary cities will subject me to ignorant left-wing name-calling. I do not think it is a terrible idea for a number of reasons. We have to keep in mind that these hundreds of thousands – maybe millions – of migrants have to be settled someplace in America – unless the Democrats have decided suddenly to support stopping them at the border. First and foremost, the leaders of those cities have been the most welcoming. They have said as much. They have put out the welcome mat. They have organized churches and civic groups to assist the migrants in their resettlement in America. They have made their cities sanctuaries. Why the sudden opposition? Also, sanctuary cities tend to have higher percentages of Hispanic and Asian populations – which compose the majority of the migrants. The new arrivals will be among people of similar cultural backgrounds and with a common language, for the most part. These communities are better able to assimilate the foreign population. In fact, because of the sanctuary city policies – which I oppose – many illegal aliens have already gravitated to those cities for obvious reasons. But all those open border Democrats and media folks suddenly abhor the notion of welcoming the migrants among them. What happened to the welcome mat? To me, it looks like their desire to resist and condemn ANYTHING proposed by President Trump created a kneejerk reaction that was not fully thought through. 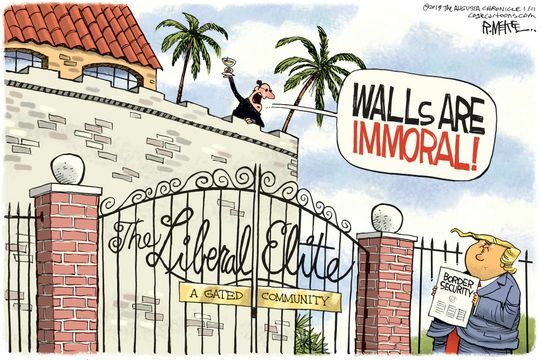 What the Democrats, the media and all the others in the #NeverTrump Resistance Movement seem to be saying is … we want no restriction on people crossing America’s border, but, for God’s sake, don’t make us live with them and provide for them. Whether this becomes policy or not – and it is not likely to be – Trump has scored a victory by exposing the phoniness of left. My first reaction to the idea was mocking laughter – and I am still laughing at the all those folks on the left who do not seem to know that Trump has pulled down their political pants.